The Dragon Keep: Good or Bad for The Dragon Age Saga? The Golf Club Review: A Massive Drive Forward for Golf Games? John, the canned audio commentator who'll admit he's wrong! A great first outing for HB Studios as a producer, creating a social, involved enjoyable golf game. A few glitches and a lack of focus and progression can hamper the game in the long run however. One of the big things that was announced at the unveiling of the latest generation of consoles was “social gaming”. The idea of course is that games will more deeply integrate multiplayer features so that you can play against friends without necessarily being in the same room or even playing at the same time. The humble game of Golf, being a turn-based sport with a rather relaxed pace is probably one of the most perfect platforms for this and newcomers HB Studios aim to take full advantage with their first self-published outing, simply called The Golf Club. Compared to the last Tiger Woods game (or really any of the last decade of PGA licensed games) where the focus is on having the right courses, the right staging and the right roster of golfing greats, The Golf Club feels incredibly minimalist, aurally and visually. The interface is very simple and uncluttered, the soundtrack limited to the sounds of nature and some very pleasing ambient music. There are a few things to customise, but otherwise it is very easy and quick to get a game going. The load times after the title screen are basically nonexistent, even when quickly shifting through all the different courses and settings, which in an age of gaming where even the attempts to mask loading have loading times is a very welcome feature. 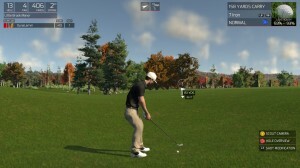 The sense of simplicity and minimalism continues through to the interface and gameplay, which uses the “slingshot” system popularised by later Tiger Woods’ PGA Tour games. You aim your shot with the left stick, pull back on the right stick and flick it forward to shoot, and then curse at the screen as you accidentally put too much slice on the shot and watch it elegantly fly into a bunker. Most of the core mechanics of golf are fairly self explanatory. Hit the ball with the club to make it go in the whole. One thing that can be criticised though is the lack of any sort of comprehensive tutorial, although seemingly to replace that you have John. John is a nice voice in your golfer’s head who very politely talks about your golfing game while you play, discussing things that may affect particular holes, how you are progressing and so on. What makes this a bit more interesting is that occasionally the system will predict things wrong, such as where shots will lie, but rather than just ignore it, as most other canned commentary would, John will correct himself, apologise and joke about his own fallibility, which I found really endearing. The minimalist interface can lead to some issues as to exactly where your shot will end up. Graphically, the game looks very crisp, with some very lovely details. The green stuff looks great, with some particularly photogenic backgrounds on occasion. The reflections and water effects in particular need to be praised for managing to nail that soft watercolour of the reflections. The game also runs very smoothly, staying at a constant 60 FPS, not that it really matters all that much for a golf game. The title alone really sums up the focus on the more social aspect of golfing, which is of course bragging about your handicap and comparing your round with pretty much everyone else with a bag o’ sticks slung over their caddy’s shoulder. The game has four player multiplayer in both local and online flavours, which works absolutely fine, as well as an interesting leaderboard/ghost mechanic. When playing certain more popular courses you will often have the ghost 3 other players of roughly comparable ability teeing off with you, which can get really interesting as you see different approaches to certain shots. It works in the same way a similar system worked in the Trackmania series and allows competition without necessarily having to work out schedules. Depicted: The social ghost system, and my fearsome golfing ability. The other big part of this is that every course in the game is procedurally generated from a series of parts. Not only does this cut on load times but also allows for the most central feature of the game (figuratively and literally); an easy to use versatile course editor. The Greg Norman course designer is very easy to use, allowing for a course to be made in minutes based on various criteria, but also allows for some customisation in case you want a bit of madness in your golf game. 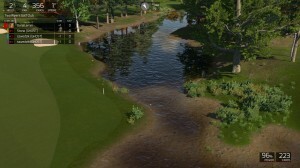 The course designer adds a huge amount of replayability to the game beyond the 12 official courses, with all sorts of community courses, tours and tournaments. Given the simplicity of the design tools there are astonishingly few terrible designs, since you really need to try to make anything completely ridiculous. The simple ranking, rating and favourite marking systems at the end of a round probably also help to avoid a lot of the issues community content has in other games. 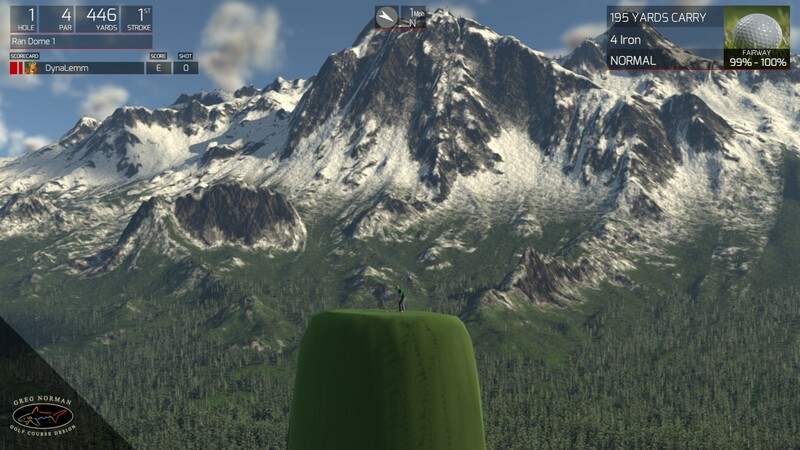 The start of my realistic golf course. Technically, for all this to be made in the Unity engine is amazing, however there are a few glitches in the initial release of the game. This mostly focuses on the screenshot feature, which can occasionally get stuck and force a restart. Some swing animations can get caught as well, which sometimes need to be messed with in order to be able to aim again. That a few issues with flickering shadows are the only technical issues with the game, but with some needing a restart, they ought to be patched sooner rather than later. For a first time publishing attempt, there is little more that can be asked of HB Studios. In terms of content, gameplay and replayability, The Golf Club has a lot to offer. It is a great game to quickly sink a few hours sinking a few difficult putts. What it does lack however is a sense of progression. 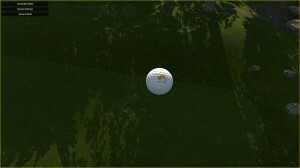 There is no tutorial, only a few official courses (most of which are rated “Hardest”), and a minimalist interface which really doesn’t help to explain some of the nuances of golfing. Like a lot of games that rely on custom content, the game really expects the player to make their own goals for the most part. For those of you needing a taste of the fairway in the absence of an EA golf game this year, this will give you what you need. For everyone else, it is at least worth a quick putt-around.